Moog Taurus II Bass Pedals full page colour advertisement from page 83 in the October 1983 issue of Keyboard magazine. Okay - time to get back to Moog for a second or two. But, I have to confess, today's blog post has only marginally to do with this advertisement. This time... it's totally personal. 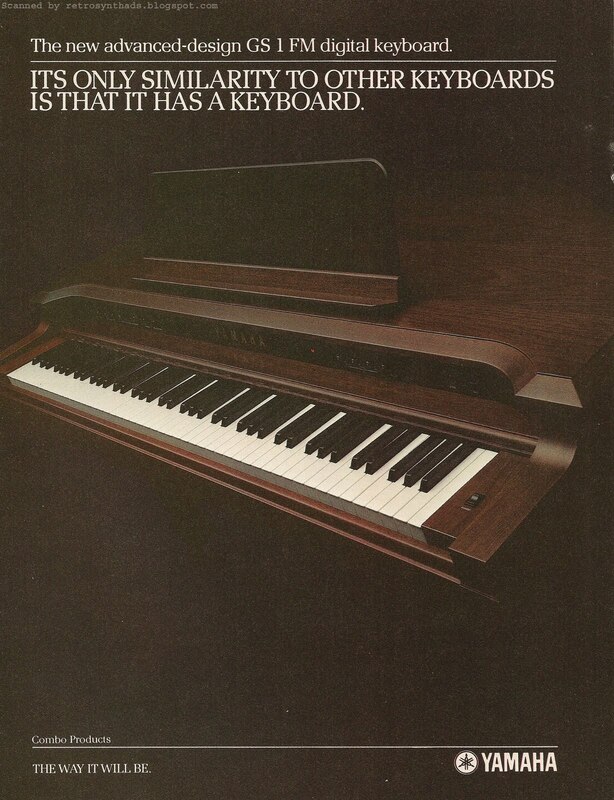 Sure, the ad is quite rare - appearing only two or three times in Keyboard in 1982/83. And, no question, the ad looks great - all futuristic-like and glowy and stuff. And even some name-dropping thrown in for good measure. The design is very similar to the Moog Rogue advertisement that was floating around during this time period, and which I've also blogged about. Both in ads and scans of Moog catalogues. It also shared a similar design with the Memorymoog ad who's theme colour was pink. Taurus II - green. Rogue - blue. Memorymoog - pink. Cute. ...like I said. This time it's all personal. You see, a couple of weeks ago - I BOUGHT MOOG TAURUS II PEDALS. 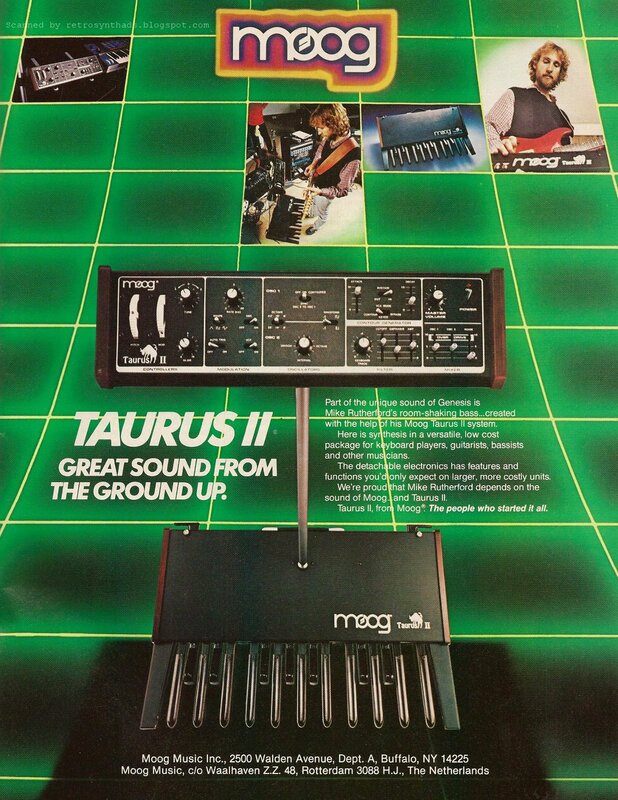 So, when the chance to purchase Moog Taurus II pedals popped up - and locally too! - I couldn't pass up the opportunity to at least go take a look. Right? Just take a look! That's what I kept on telling myself any ways. I contacted the seller and it turned out he lived a block away. One street over. No kidding! Too good to be true, Right? I suddenly believed in fate. But, because I was still on the fence to shell out the cash, I was upfront with the seller, stating that I was interested in the pedals, but if he had other offers, go right ahead and sell. BUT, if they were still in his possession the following Monday, I'd like to come over and take a look. Thinking he might be hesitant to let a total stranger into his home I sweetened the deal by offering to bring over the Taurus I pedals so we could compare the two. And so the Taurus date was set for the following Monday! Monday slowly crept along and I pulled out the T1s and drove them over. Yup - drove. One block. Don't judge. He greeted me at the door and we walked down into his basement. 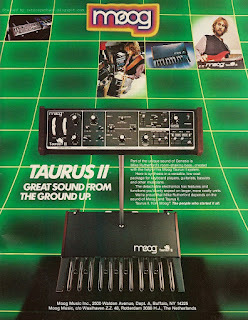 And the first thing I saw... nope - not the Moog T2s - but Moog Taurus III pedals! Turns out he had bought the T3s to replace the T2s. So, after checking out the T3s for just a moment or two (love the lighted footwheel controllers on that thing! ), soon my eyes focused in on the T2s. Embarrassingly, I really hadn't done my homework. So when I saw the T2s, I was actually quite surprised how closely they resembled the Moog Rogue synthesizer. I mean - almost EXACTLY like the Moog Rogue. 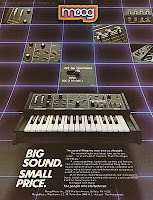 Take a look at the controller in the ad, and then compare it to this image of the Moog Rogue on Vintage Synth Explorer. I know, right?!?! I'd heard they were similar. But didn't realize they were *that* similar. Then the seller had the bright idea to take some photos. PHOTOS! And it was at that point that I think I finally realized the significance of this experience. I was just soooo excited about the pedals that I didn't even think to bring a camera. Lucky for us - he had his GF's iPhone handy. And yes - I have the T2 bar that connects the unit to the pedals at waist height. But for the photo, I thought I would remove it to get everything at the same level. Well. That was that. I had to have them. We shook hands and exchanged some cash. Well, actually, cash exchange occurred over two days. But, point is, I finally had both the TIs and TIIs set up in my studio. A friend came over that evening and rather than work on music, and we noodled around on the T2s. Especially fun was hooking up the TR808 as a trigger input and figuring out what exactly it triggered. Nice. We also put the XOXBOX through the external input - also sync'd from the 808. Time and money well spent. And, gotta say, I'm happy to report that good people and fair prices still exist out there. Now time for me to get the new Taurus III pedals. If I can find a pair! Yum! Yamaha DX "Special Announcement to Purchasers of Yamaha DX Digital Synthesizers" DX7 and DX9 full page advertisement from page 53 in the February 1984 issue of Keyboard Magazine. I'm enjoying a bit of time out at my parent's farm this weekend. And that means more chainsawing. 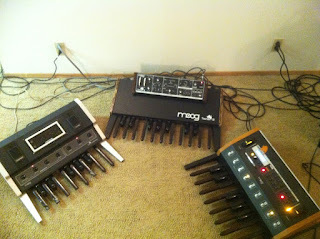 A good session with a chainsaw is almost as satisfying as a session with my Moog modular. Both can be temperamental. Both produce awesome results in the right hands. In my hands... er... let's just say that I go for quantity, not necessarily quality. If it were at all possible, the modular and all my other hardware would travel with me - there is a lot of downtime when relaxing out here. The perfect atmosphere for creating music. But this time I didn't even bring my Ubuntu netbook with Renoise. I've actually been reading a book. You know, one of those thing made out of paper. Wow. Hmmm - this special announcement pretty important information for Yamaha to suddenly their ongoing advertising campaign for their newest and hottest DX7 and DX9 synthesizers. But, as soon as I see those little "advertisement" tags in the top corners of this full page ad, I start to get suspicious. It makes me curious as to what the real motivation was for this thing. Could the demand have been that great for the DXs that a grey market through unauthorized dealers really could be putting that big a dent in the profits of authorized dealers? Or was it just a US dollar thing such that it was relatively cheap to import products, including synthesizers, during this time period? Or was it just a hidden advertising opportunity to let users know of the "valuable accessory package" available, including "volume pedal, sustain pedal, owner's manual, music stand, demo cassette tape, instruction cassette tape, ROM and RAM cartridges, instruction and follow-up material, subsequent manuals, information on software... etc... etc... You get the picture. "The U.S. Federal Communications Commission requires all such equipment to be certified. Any retailer of uncertified equipment is subject to severe penalties. And any purchaser may be subject to forfeiture of the equipment." No matter what the reason, the ad only seems to have ran once. Not really a lot of effort if Yamaha was actually serious about the whole thing. Unless this really was a necessary communication, I think this space could have been much better used as an educational opportunity for Yamaha to start the process of explaining FM synthesis. Up till now, DX ads and an early reviews have been very high-level when it came FM - focusing mostly on the pieces (operators, envelopes) and not necessarily how they combine together to create such pleasant sound. Oh - ads, reviews, and this Spec Sheet promo that finally appeared in the November 1983 issue of Keyboard Magazine. Some good reference info, but I still think readers wanted more in-depth knowledge. "Yamaha Synthesizers. The Dx7 and DX9 are two completely programmable 16-voice FM digital synthesizers from Yamaha. Both instruments feature 61-note keyboards, programmable modulation wheels, breath controller inputs, and foot controller inputs for volume, sustain, and portamento functions. The DX7 also has a modulation pedal input. The DX7 features 32 user programmable presents, an EEPROM (electronically erasable programmable read-only memory), and six operators – combinations of digital oscillators, envelope generators, and VCAs. Its keyboard is both velocity- and pressure-sensitive. The DX9 features include 20 user-programmable presets, a cassette interface for external memory expansion, and four operators. Prices are: DX7, $1,995.00; DX9, $1,395.00. Yamaha. Box 6600, Buena Park, CA 90622." Hmmm - actually I should take a closer look at some of the magazine articles around this time. It could be that Bob Moog or someone else at Keyboard Magazine has been writing about FM synthesis in more detail all this time I've been complaining about lack of education. End note: It really cracks me up that the DX7 comes out of Yamaha's "Combo Division". Really? Part 2 of Yamaha DX7 "The Performance is about to begin" 2-page colour advertisement from page 42 and 43 in the September 1983 issue of Keyboard Magazine. As mentioned in my last blog post (Part 1 of this DX7 ad) - although I have been focusing on Keyboard Magazine when it comes to Yamaha's new DX line, I was still interested to see if other magazines were getting in on this new FM action. And one of the biggest surprises for me was found in a DX7 review in the US/Canadian version of International Musician and Recording World (IMRW). More specifically, the photo of the prototype DX7 with it's "merged" DX logo. But there was more to that October 1983 "On Test" review of the DX7 than just that unique photo. Readers of IMRW were probably very happy to read that rather well written three-page review. "I must confess that at the outset my brain refused to have anything to do with comprehending the system, but after about an hour of messing around, I began to see some light at the end of the tunnels." The review starts off with a bit of theory surrounding algorithms and then into the construction and design of the instrument itself. Then he gets down and dirty into the complicated business of editing sounds, and seems genuinely relieved when he gets to some familiar territory - the "old faithful" LFO section. LOL! The conclusion in particular is interesting, taking up almost one-third of the total review. For one, he specifically references Yamaha's advertising during the time period! "To return to the matter at hand. I would definitely agree with some of the advertising blurb that Yamaha are waving around. It does create some excellent and authentic sounds although Yamaha's blurb admittedly goes over the top. The capabilities of digitally-generated sound to mimic acoustic qualities is at times quite stunningly authentic. The clarity of tone is also most impressive. But I think it is important to keep in mind that this instrument will not replace the area of sound that its analogue competitors cover, nevertheless it opens up other avenues." "For me, one of the dumbest design faults has got to be the lack of stereo audio output. One of the most important characteristics in synthesis is the spatial placing of sound, therefore the imaging of the sound." Even with these and other faults, in the end he seems extremely happy with the instrument, especially at the price point Yamaha is selling them at. ...It would have been helpful if they had concentrated on making their format far more "user friendly". A clearer explanation of reasons for choosing one particular algorithm as opposed to another would be very useful. Many of the problems could have been solved if, for example, instead of using two small displays (patch no. and parameter status/select) they had developed something like a mini TV monitor panel within the keyboard to enable you to see all the tuning functions of the Operators at a glance, as well as their relevant Envelope settings… …As more keyboards become computer-based instruments, it is essential that manufacturers don't lose sight of how user helpful they are entitled to be." Bang on, Paul. Bang on. Yamaha DX7 "The Performance is about to begin" 2-page colour advertisement from page 42 and 43 in the September 1983 issue of Keyboard Magazine. Okay. Now we're talking. Yamaha finally getting serious about the promotion of the DX7. This two page centerfold appeared in the September and October 1983 issues of Keyboard Magazine and I seriously would have considered putting this thing up on my wall if it had been available as a poster. 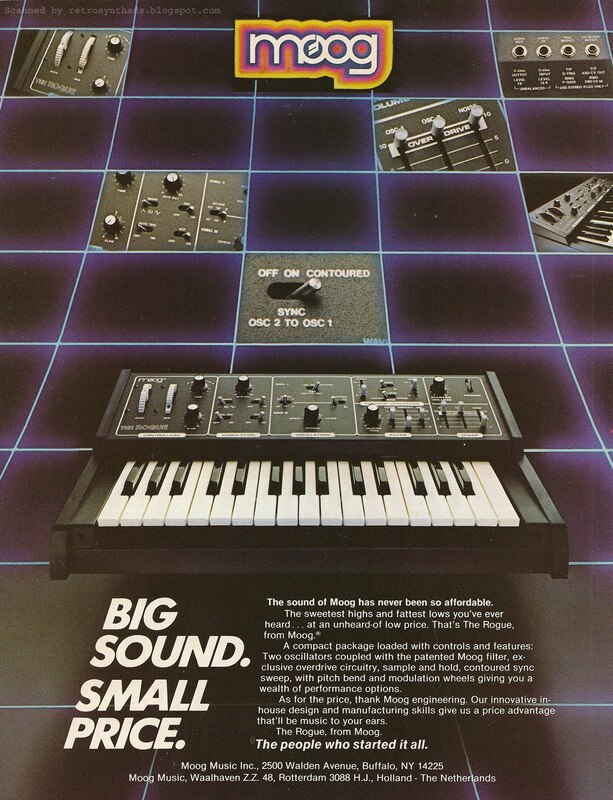 It has everything that makes a synthesizer ad great including a snappy ad-title in a large font and a really large feature photo of the synthesizer itself. Believe it or not, this is probably the first time many readers may have seen a clear photo of the actual instrument in a DX ad. The ad also includes some great informative ad-copy, as well as images and testimonials from some of the biggest names in keyboards and synthesizers - Elton John, David Paich/Steven Porcaro, Quincy Jones, Chick Corea, Michael McDonald and Jerry Goldsmith. I wouldn't be surprised if each of those artists ordered copies of their illustrated photos. I'm really digging them. And what really makes this a really really awesome advertisement is how those last two features - the ad-copy and the testimonials - balance each other out. 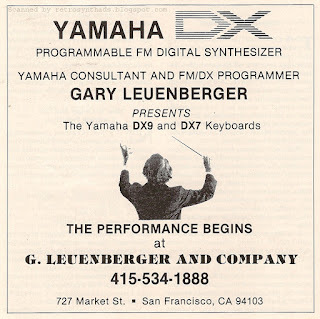 I think the ad writers knew there were two audiences to be catered to when it came to the DX7 and FM synthesis. The logical types that like to read vast amounts of technical info about the synth. And the creative types that just want to know if and how the DX7 can create great sounds. So, I'm thinking that Yamaha consciously split that audience up. The technical types would be drawn to the ad-copy and probably start reading immediately, eating up every last technical crumb about FM, operators and mathematics. But the creative types would probably ignore large amounts of ad-copy, so those illustrated images of their favorite musicians act like magnets to draw their attention to those deliberately non-technical testimonials: "Lets me capture the mood". "Great warmth and colour". "The sound speaks the melody". "Open a new world of sound with colors I could imagine, but not express musically". "For any of you familiar with FM digital, those prices have probably prompted you to split for your local Yamaha dealer already, so goodbye, this ad is over for you. For those still hanging around to find out more, here goes…". And the rest of the ad-copy goes on to explain FM synthesis and the technical features of the machines. 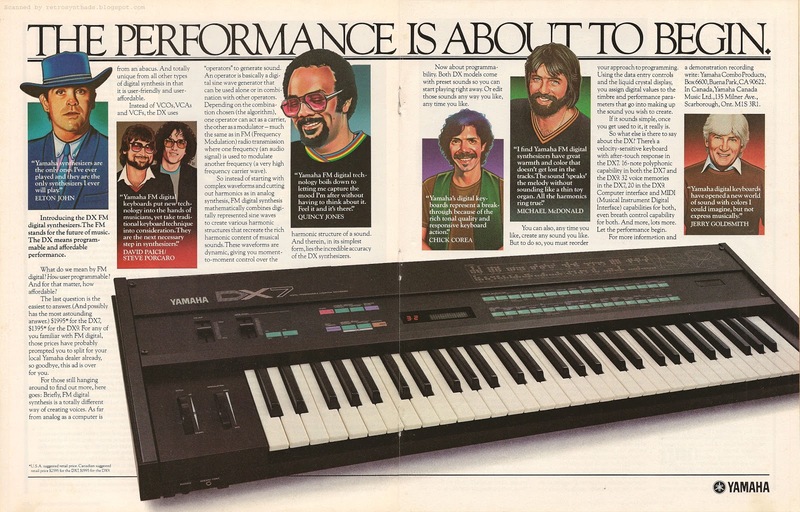 I'd also like to point out that the ad also contains a few other great historical references including Canadian suggested retail prices - $2,595 for the DX7 and $1,995 for the DX9. If I was going to be a bully, the only thing I could pick on is that Yamaha logo. It looks like they chose to use the same logo size and style as for their one-page ads, but I find it kinda gets lost in this two page spread. But again, I'd have to be a real douche of a bully to start a fight in the school cafeteria over that one. Enough about the ad. Although I have been mostly focusing on Keyboard Magazine, I was interested to see if other magazines were getting in on the new FM action around the time that the machine first launched. That's a photo of a DX7 from an "On-Test" review found in the October 1983 issue of the US/Canadian version of International Musician and Recording World (IMRW). Look closely. Did you spot it? Scroll back up and look at the DX7 logo in the top-right corner of the synthesizer in the ad. That's the logo I am familiar with. Now look at the logo in this photo again. It's different - the D and X are merged! Something I hadn't noticed before and so I immediately started looking for other photos of DX7s or any other DX instrument with this special logo. I couldn't find anything. And then, coincidentally, the other night I'm on the Vintage Synth Explorer forums and someone posts THE EXACT SAME QUESTION. Awesome! The poster - desmond - included a photo with a DX7 and DX9 with the old logo from http://www.kratzer.at. So, now we have two photos with the old logo. "I notice the 5 jack sockets on that DX7 seem to protrude out the back. On the two mk1 DX7 I have used (both of which had the regular logo) the jack sockets were flush with the back panel. Also, some of the front panel markings are different. There is no "Keyboard Level Scaling" graph for example." "I also notice the white strip (that says "play") under the memory select switches is missing. It was presumably added to production models so users could easily locate the modes where you select presets ...and therefore make this sophisticated hi-tech digital technology seem a little less daunting! " There's more to that October 1983 IMRW DX7 review than just this interesting photo. This early review of the DX7 really helps put Yamaha's new FM technology into a historical perspective. But that will have to wait until Part 2. Yamaha DX9 and DX7 Gary Leuenberger 1/4-page black and white advertisement from page 22 in the August 1983 issue of Keyboard Magazine. 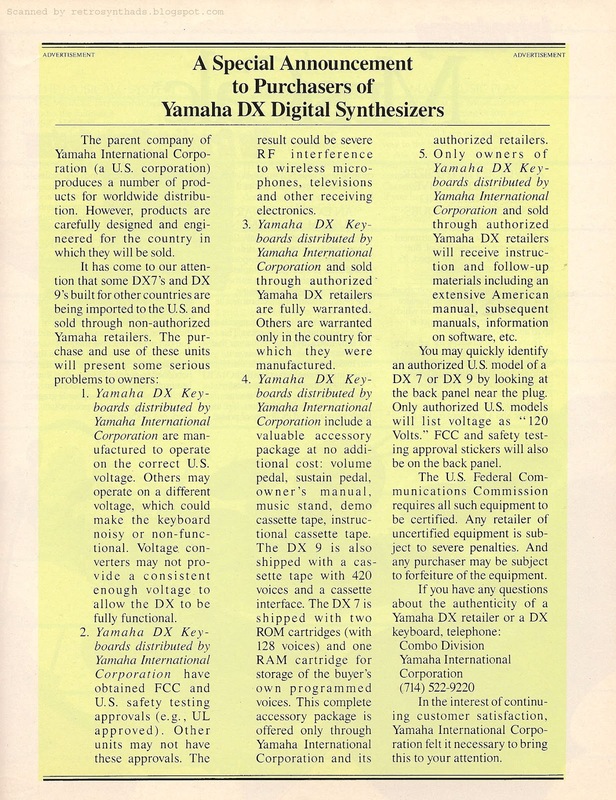 If my last blog post featured the very first Yamaha "DX" advertisement in the July 1983 issue of Keyboard Magazine, then this little quarter-pager appearing a month later is actually the first advertisement to promote the DX7. Strange. And cool. But before I go on, I just have to mention something else about the August 1983 issue of Keyboard Magazine. Why, hello there Thomas Morgan (Dolby) Robertson. Do you remember me in row seven dancing in the isle during your Flat Earth tour? What? No? Gah! It took you a while to get to my small neck of the Canadian woods. But when you finally did, you did not disappoint. In fact, you did the complete opposite of disappoint. Yah, that. It was crazy hard to find information out about him back then, so when this issue came off the presses and into my mailbox, you can bet it was cut up with a pair of scissors and the photos up on my wall by the time my mom and dad came home from work that same day. Due to those scissors, this cover photo scan is obviously not from my original magazine collection. Thank you very much eBay. I have never stopped following his career. And now with his Web site, Twitter and every other type of communication platform, its a whole lot easier to keep track of him. Okay, just one last thing to say about him... and a little too much information about me: I've always fantasized Thomas Dolby would marry Annie Lennox and they would have cool kids. Does the name Garry Leuenberger ring a bell? Back in May 2010 I posted my first Garry Leuenberger advertisement for the Yamaha GS1. Yup - besides being the guy with a wack of vowels in his last name, he's also the guy that got the jump on Yamaha by putting out his company's GS1 ad four months before Yamaha's appeared. 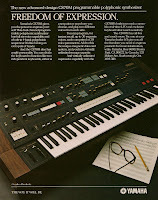 His relationship with Yamaha is not just in selling instruments either, as this ad mentions, he was a Yamaha consultant, which included the programming of patches for the GS1 as well as for a CS80 patch guide. Did I just quote myself quoting another quote. Yoiks. Point being, if anyone was going to be at the front of the pack with this new era of FM synthesis, it's Gary. And he's even got the balls to switch-up Yamaha's own DX ad-slogan of "The performance is about to begin" to his own The Performance Begins. 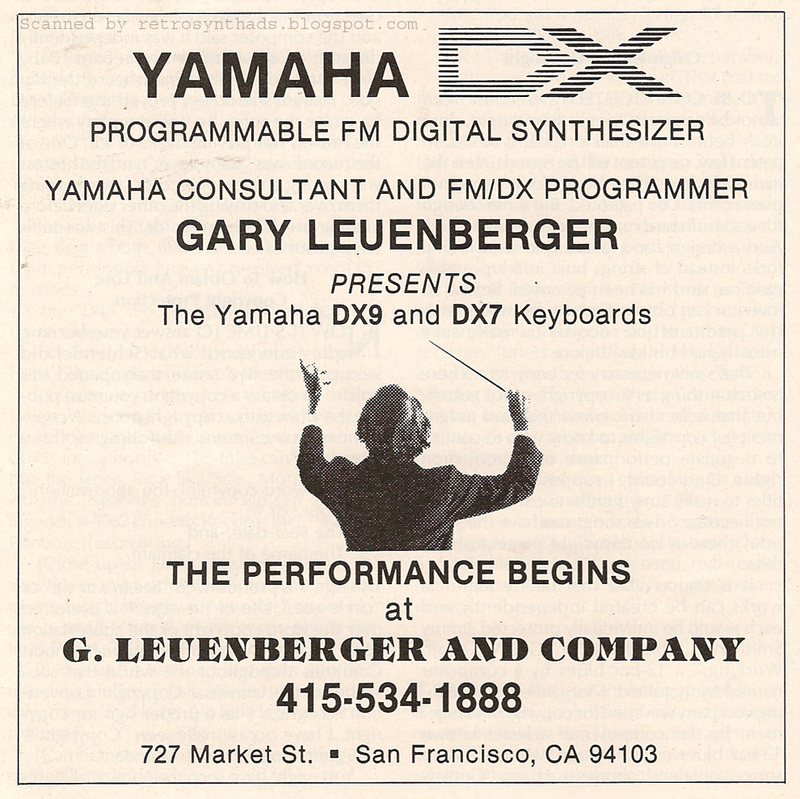 Yamaha's first minimal introductory ad for the DX series only ran in the July and August 1983 issues, and this GL advertisement only ran in the August and September 1983 issues. Not much of an initial bang for FM synthesis, I'd say. But Yamaha would throw everything they had into the next DX advertisement and finally give the the DX7 and DX9 the attention they deserved. Yamaha DX9 "The performance is about to begin" 1-page introductory colour advertisement from page 75 in the July 1983 issue of Keyboard Magazine. Yup. You're looking at it. The beginning of (relatively) cheap programmable FM synthesis. 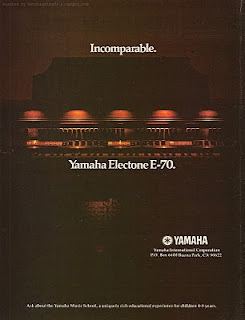 Prior to this advertisement appearing in the July 1983 issue, Yamaha had been cycling through a number of ads that year for their PS10/20, PC100, CP10/11, CE20 and even the CS70m. And then Yamaha went silent in May and June. 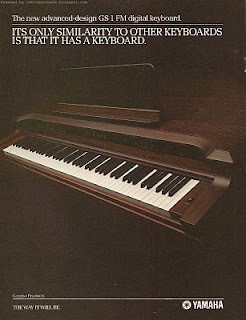 Although it reads like a "pre-launch" advertisement, I've been assured by a few sources that DX7 and DX9 synthesizers were already starting to make it into retail stores either during or shortly after this ad appeared. And indeed, these new DX instruments were definitely up and running, showing up a month earlier with the Yamaha crew in Chicago at the June 1983 NAMM show. Although everyone at the show was going bonkers over the newly launched gadgetry known as MIDI, there was still a number of high-profile synthesizers getting noticed at the show including Octave Plateau's Voyetra, Sequential Circuit's Prophet T-8, and Kurweil's "private showings of the prototype for their new sampling instrument". <---- Yum. "Yamaha brought out two new instruments that use all-digital technology. The DX7 and DX9 are both totally programmable and have five-octave keyboards. The keyboard on the DX7 is both velocity- and pressure-sensitive. Demonstrating the capabilities of these two new products were Toto's David Paich and Steve Porcaro, along with James Newton Howard, formerly with Elton John's band. On-board memory of these units was initially 32 programs, expandable through a ROM pack port. However, we're told that on-board memory is being expanded to something like 256 memory positions. The FM technology used in these instruments is the same found on Yamaha's GS1 and GS2, and since the DXs are programmable you might expect them to cost even more than the GS1. One of the surprises is that the list prices are $1,995.00 for the DX7 and $1,395.00 for the DX9. They're also MIDI-equipped." 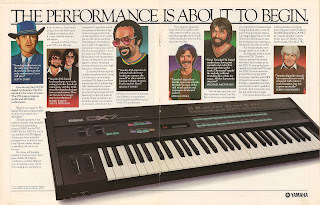 Of course, unless at the show in June, July's introductory ad might have been a synth junkies' first introduction to the new DX brand since the article didn't appear until the September 1983 issue. I'm sure they would get dang curious after seeing the ad. Side note: I wonder if anyone was a little miffed at Yamaha's choice with "DX" for their new offering when Oberheim had already introduced a "DX" drum machine that had advertisements also running in Keyboard at the exact same time. Not that there would be confusion. Just pointing it out. Anyways, I was originally going to give this blog entry a more generic FM title that could cover off both the DX7 and DX9. 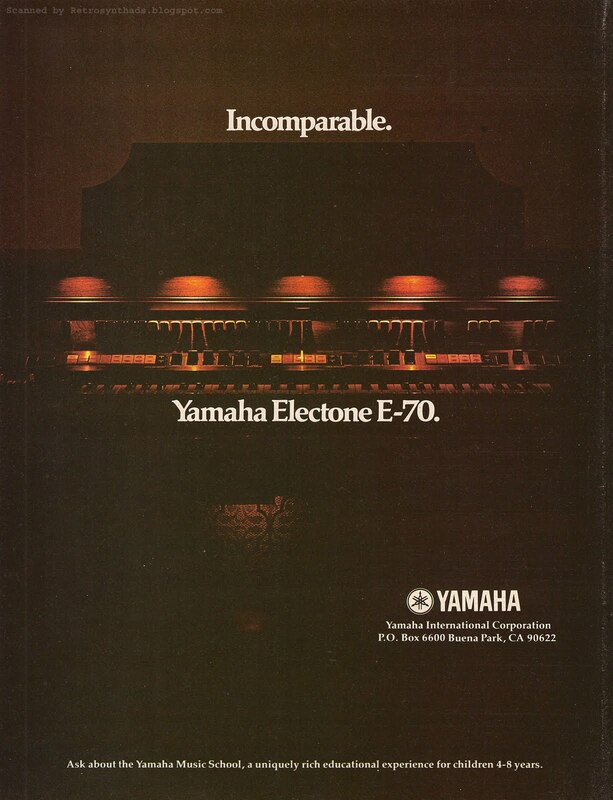 Through the use of dramatic lighting together with the dark background of the ad, Yamaha did a good job of keeping the synthesizer in the photo looking mysterious, kinda suggesting that Yamaha wanted to leave it more generic to cover off both synths. But I can still just make out the "DX9" name in the top left corner of the front panel as well as the four-operator algorithm diagrams in the top right. Plus, the title itself provides the DX9's lower $1,395 price point. So, in the end I went with a more direct DX9. 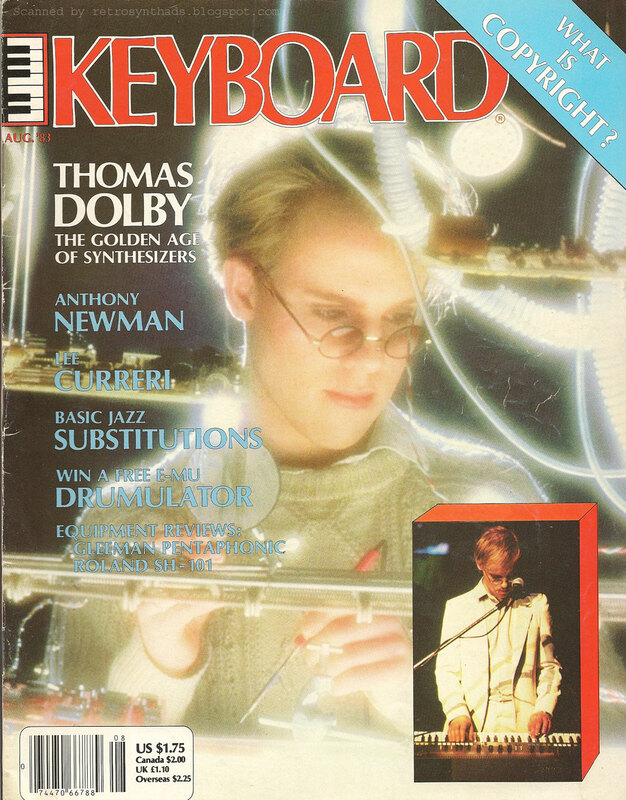 Plus, since I had always thought the DX7 was promoted prior to the DX9, giving this a DX9-related title helps make the point that it graced the pages of Keyboard Magazine first. Respect to that! Yamaha advertisements had a number of different design themes depending on the series of gear being promoted. And although this ad is really the start of a "new" series of gear, the designers of the ad did keep a few characteristics from previous ads. 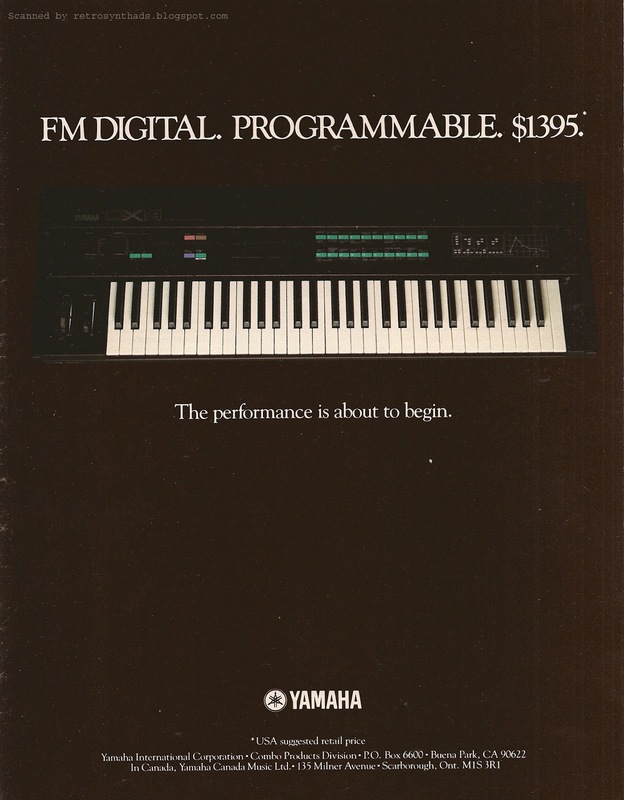 For example, Yamaha used the dark background and eye-popping white title and ad-copy found in ads like this 1982 CS70m advertisement. The best example probably comes straight from ads for the DX7 and DX9's FM big daddy - the GS-1. 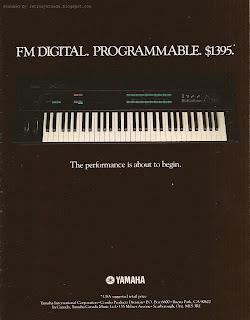 In my blog post for this ad and another GS1/GS2 advertisement, I explained my thoughts on Yamaha's decision to keep the complicated mess that can be FM synthesis out of the ads. And since the GS1 wasn't programmable anyways, why complicate things. Its a magic box. End of story. So, Yamaha made the right decision and kept FM simple in ads for the GS1 and GS2. And, based on this first introductory ad for the DX9, they also seemed to be keeping it simple for the next generation of FM synthesizers. 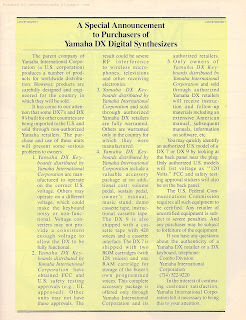 But would Yamaha be able to continue to keep it simple in DX ads? We all know that the DX9's bigger brother the DX7 managed to become "the first commercially successful digital synthesizer" even though it had the "reputation of a hard-to-program synthesizer". Wikipedia's words, not mine. So, whether Yamaha or anyone else was able to explain how FM worked in ads or articles, the company was still ultimately the winner. 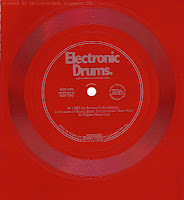 After my last blog post on the LinnDrum, I received not one, but two emails asking for information about the Electronic Drums book I referenced as an offline resource. Yes, I know - this book is not really an ad. But I think you will agree the addition of the excellent sound sheet in the book almost makes it promotional material for Linn, Oberheim and Simmons. But don't give the machines full credit - the author/musician playing the gear on the sound sheet gets a lot of it. If you haven't guessed by the opening paragraph, I'm a big fan of the synthesizer and drum machine reference books that came out in the 80's. Books like Synthesizer Technique and Synthesizer Basics that were compiled by the editors of Keyboard Magazine (and part of the Keyboard Synthesizer Library series) are great reads. Another publisher also capitalizing (in a good way!) on the popularity of electronic gear in the mid-80s was Amsco Publications - and they seem to still be around today! 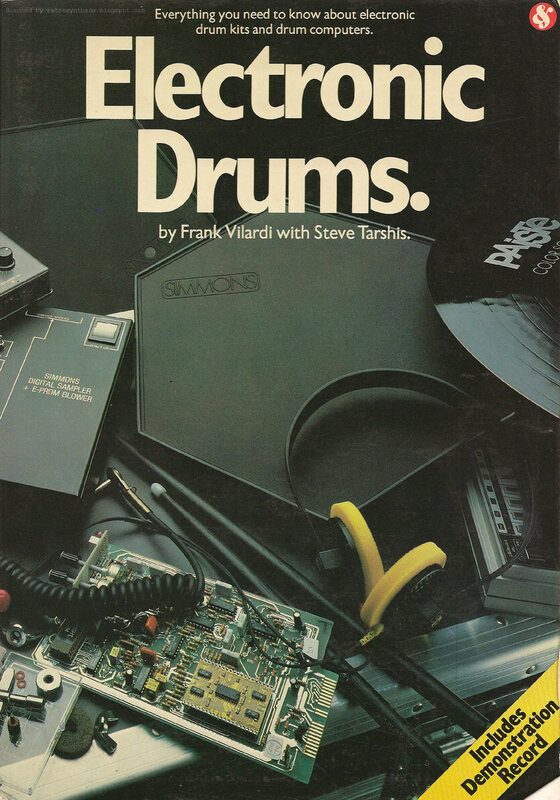 The company released more than a few great books, including The Complete Guide to Synthesizers, Sequencers & Drum Machines by Dean Friendman, and this book - Electronic Drums - by Frank Vilardi and Steve Tarshis. And like I said... I *love* these handy little reference guides. Old, yes. But a lot of good information packed into them. The book itself is 85 pages, and includes a rockin' two-sided sound sheet. The sub-title of the book pretty much explains what the book is about - "Everything you need to know about electronic drum kits and drum computers". The author profile at the back of the book provides a bit of background information about the author Frank Vilardi. He's described as a free-lance drummer working in New York City "working in recording studios doing records, films, TV and radio jingles". He was also involved in touring and teaching electronic drum workshops. That's a pretty full plate. Steve Tarshis also has a Web site and includes an also-impressive bio working as a musical director, a musician for several Broadway and Off-Broadway musicals, instructor, lecturer and instructor. Coolest of all is that his news page has him currently listed as the Director of New York area kid's rock camp called Camp Jam at Hofstra University from Summer 2010 to present. "No canoes - lots of rock". Hee hee! I've included a short summary of each section below. Section 1 is titled Electronic Drums and provides two-to-five page summaries on the features of a number of electronic drum kits including Simmons SDS 5, Pearl Fightman, Simmons SDS 8, Tama Techstar, Simmons SDS 7, E-Drum by E-mu and Simons SDS-1. 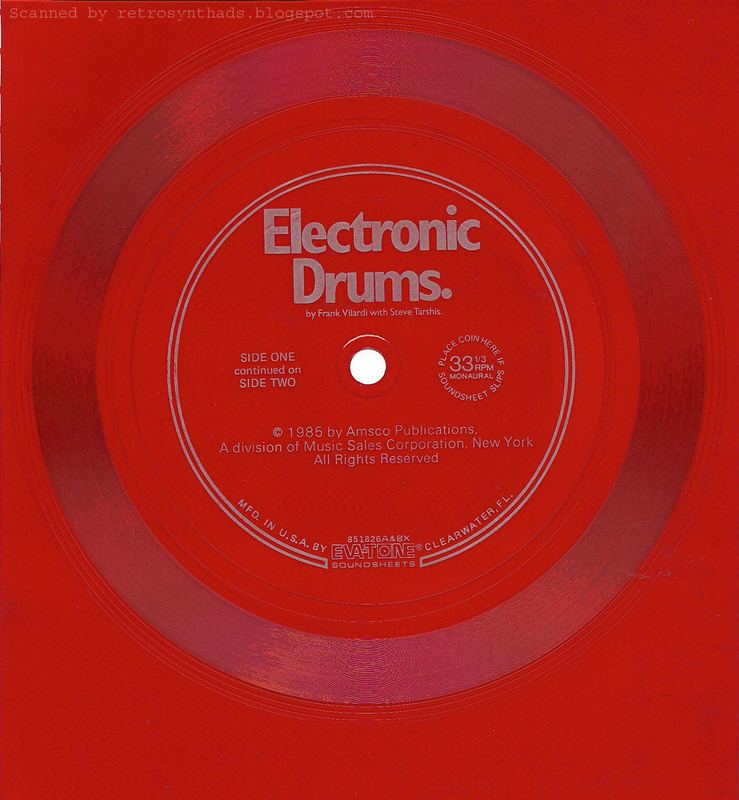 Section 2 is titled Digital Drum Computers and provides summaries on the features of a number of drum machines including LinnDrum, Oberheim DMX and DX, E-mu Drumulator, Roland TR-909, Roland TR-707, Yamaha RX11 and RX15 and finally the Linn 9000. Section 3, probably of more interest to drummers and those without any drum machine knowledge, is a section called Programming a Song, and the whole second side of the demo sound sheet that comes with the book is devoted to this section. Section 4, the last section, is called Triggering and Sampling and provides just a page or two on the some of the devices that have started to appear for this purpose. The book also includes a description for both sides of the sound sheet, which I've included below. It was programmed and played by Frank Vilardi except for 4, listed as being programmed by Rick Kerr. Recorded by Rick Kerr at Planet Sound, New York City. Starts with LinnDrum. Percussion sounds only heat continues throughout. Acoustic drums are dropped out. Simmons bass and snare drum that are being triggered from acoustic drums continue. Acoustic drums reappear to join Simmons and Linn. Begins with Acoustic drums and triggered Simmons (bass and snare). Linn drum is added. The swing or shffle function is being used here to create the reggae feeling. Starts with Linn drum playing a tipical "dance" type of beat. The first tom fill is the Linn. All subsequent fills being overdubbed on the Simmons SDS 7. The kits are being changed every two fills to demonstrate some of the sound possibilities. This example was programmed entirely on DMX, using all factory sounds. there are two separate programs of the drum machine running in sync to each other. This technique, along with some non-standard tunings are studio equipment can be used to create some very interesting effects. Side 2: This side demostrates the programming of the song demonstrated in the book. Done on Linn Drum. Count off - Program 77, Measures a & b. Intro - Program 11, Measures 1-4. Verse - Program 12, Measures 5-10. End of verse - Program 13, Measures 11 & 12. Chorus - Program 14, Measures 13-18. Seventh bar of chorus - Program 15, Measure 19. Eighth bar of chorus - Program 16, Measure 20. Bridge - Program 17, Measures 21-25. Fill at end of bridge - Program 18, Measure 26. I've seen a couple of copies of the book pop up on eBay and Amazon used books. If you dig these types of books, definitely pick up a copy if you can find it at a decent price. And wouldn't you know it... before I posted this, I snatched another nicely priced copy on e-Bay - including the sound sheet! Thank you Frank and Steve and Amsco for creating this book! Pure awesomeness. 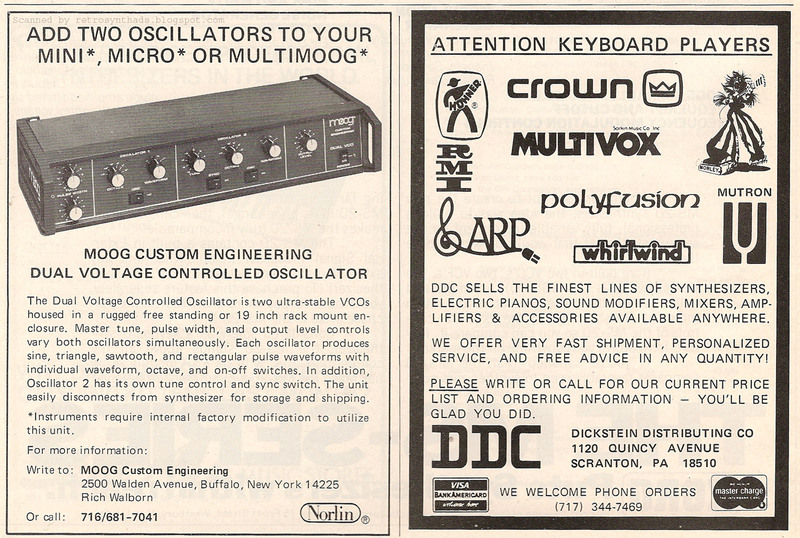 Moog Music Inc/Moog Custom Engineering "Dual Voltage Controlled Oscillators" 1/4-page black and white advertisement from page 46 in the January 1979 issue of Contemporary Keyboard. 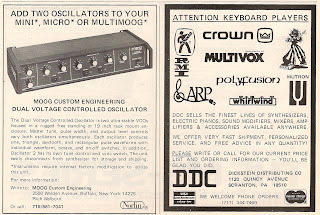 Like the first Moog Custom Engineering advertisement I posted, I decided to post the reseller ad that sits beside it. This time there is no real comparison I want to make, so maybe its because I haven't felt like writing too much lately and that extra little ad is a bit more of a diversion. Unlike the first MCE ad, this one includes a few more layout elements. Like an actual title. And even paragraphs. Plus a photo! The ad itself has a lot of good reference info about the Dual Voltage Controlled Oscillator. "These were made by Moog Custom Engineering in the late 70s (along with the 3-band Parametric EQ, Graphic EQ, 12-stage Phaser, String Filter, and Vocoder) and reportedly are close to Mini Moog D oscillators"
Wow - that's quite the oscillators to use as a comparison. Good company, indeed. But its actually the first part of that quote that intrigues me most. It seems that lately, Moog Custom Engineering often gets associated not just with the more "alternative" Moog products like their modules or mods for existing gear like this Dual VCO, but also with the Moog signal processing gear like the Parametric EQ, Graphic EQ, 12-Stage Phaser or Vocoder. My last post on a Moog Signal Processors advertisement that came out around the same time period clearly indicates that this is a straight-up Moog product - even including the Licolnwood, Illinois address rather than the Moog Custom Engineering Buffalo New York address. "Moog Sample-Hold Module. The 1528 Sample-Hold module samples an applied signal under the control of an internal clock or external trigger. The internal clock is voltage-controlled with triangle, V-trigger, and S-trigger outputs. The external trigger inputs accept V- or S-triggers. The sample circuit has variable glide and is adjusted for zero offset. Gain is unity. The 1528 is the same size as the 900 series Moog modules and its signal levels are compatible, but it requires a +-20 vols to +-24 volts DC power supply @ 50mA for operation. Moog Custom Engineering. 2500 Walden Ave., Buffalo, NY 14225." So, after noticing this apparent differentiation, I starting asking myself how Moog might have distinguished what fell under the Moog brand, and what would fall under the Moog Custom Engineering brand. "At the time of that ad, sales and marketing were being run out of Norlin in Lincolnwood, but everything else... production, engineering, service, etc., was still done at the Cheektowaga plant (just outside Buffalo). By then orders for modular systems and custom modifications were very few and far between. We were producing fairly good quantities of Minis, Multis, and Polymoogs, and several new models were in the works. Building modular equipment on such a small scale just didn’t fit into a volume production environment, so it was handled in the engineering department... same building, different area. It’s been 34 years, but as I remember, there was really no dedicated Custom Engineering Staff. At that time a lot of the custom work was done by one guy, but all of it was done by engineers and production workers that spent most of their time on other projects." The email reply is full of great historical info, and the one thing in particular that it suggests is that indeed Moog Custom Engineering - at this time at least - wasn't really a department of sorts. It was more of a "brand". So, then why create a second brand when Moog is already such a huge, well respected name in the synthesizer industry? I have a guess (surprised? :) Here's my thoughts - and one I'm still working on. There were certain Moog products that only worked through modifications or customizations. And since production, engineering and service was still run out of Buffalo, it would make sense to push any orders or questions concerning these products directly to the staff that could answer them. On the other hand, questions concerning instruments like Minimoogs could probably be handled at the reseller level, so therefore the marketing department address was fine to use in normal Moog ads. Okay. I know. Just a guess. But, no matter, splitting your brand isn't necessarily a good thing. It can lead to confusion in the short term until people figure it all out. Moog? Moog Custom Engineering? Buffalo? Licolnwood. Gah. And I'm all about consistency. So you could see why I get all bajiggity about this stuff. Anyways - that's the end of my ramblings. Am still researching and will post more as I learn. I leave you with this YouTube video by VintageStuff2. A micromoog with the Dual VCO (and a few other juicy Moog products). It starts off a little slow... but still, only 76 views? WTF?!? !